After exploring Newport's Cliffwalk and The Breakers, our light breakfast had worn off and we were ready to start thinking about lunch. Dede and Carter decided to check out a pizza joint. I love pizza, but I was interested in sampling more local cuisine, so I left them and headed a couple of blocks over to Spring St. where I stumbled on a cute little artisan cafe called Rosemary and Thyme. It was just the kind of place that gets my attention...one of a kind, tiny (only about four tables) and everything made in house. I walked up to the counter, studying the menu. Everything sounded delicious! Salads, artisan sandwiches, tartines, vegetarian options, and all kinds of baked goods, I wasn't sure how I was going to choose. Finally, I narrowed my choices down to two, either the Brie and Pear or the Bahn Mi. The Brie and Pear was built with poached pears, French brie, caramelized onions, prosciutto and fresh greens on a French baguette. The Bahn Mi had roast pork, pork paté, pickled vegetables, and scallions on a baguette. Completely different, but they both sounded divine. Which one do you think I chose? If you said the Bahn Mi, you would be correct. And what put it over the top? The pickled vegetables! I just could not resist. I also could not resist one of these chocolate pastries with almonds and hazelnuts. They were just sitting there in the case staring at me! I chose well. I think this one little sandwich was the best thing I ate all week. It was so good! I ate half of it and took the other half with me and ate it for breakfast the next morning. And that Pain au Chocolate? Delicious! It was flaky, chocolaty, and the almonds and hazelnuts provided the crunch and saltiness that elevated the whole thing to the next level. Rosemary and Thyme, I love you so! Would it be too much to ask you to open up a satellite shop in Alabama? Saint Mary's, the church where Jackie and John Kennedy got married, is just a short walk from Rosemary and Thyme. Later when we were driving around checking out the scenery, I happened to look up and see that we had just driven by Hammersmith Farm where the Auchinclosses, Jackie's mom and stepfather, lived and where the wedding reception was held. These are places I have read and heard about all my life and suddenly were right there. Newport is so beautiful..lots of wonderful old buildings and understated elegance. We enjoyed driving around town and at one point, we found ourselves back on Rhode Island's rocky shore at Brenton State Park. As beautiful as it was, we were still completely amazed that people were perched on the rocks with their beach chairs and umbrellas. For someone used to the sugar white sands of the Gulf of Mexico, this really was an unusual sight. This guy didn't seem to mind that we were visiting his beach. We left Newport, all agreeing that it was really beautiful and a place we would like to visit again. Next stop? Providence. We were headed to the capital city for an event called Waterfire. We didn't have any idea what to expect, but it sounded intriguing. Founded in 1636, Providence is one of the oldest cities in the country. We parked near the Rhode Island State House and walked to the downtown area where Waterfire is held. Three rivers, Providence, Moshassuck, and Woonasquatucket (say that five times real fast) all converge in Providence giving it a European flavor. On certain nights from May to November, bonfires are lit in the water throughout the city and we were lucky enough to be in town for one of those nights. With the fires burning in the water, boats and gondolas carrying performers and music setting the mood, Waterfire is quite an event. All along the water's edge, there are restaurants, shops and businesses. We passed by a vendor selling Del's Frozen Lemonade. Since that was one of the "we gotta try that" items on our list, we bought one to share. I was a little skeptical as to how the cold treat could be as good as the hype surrounding it. Once again, I was proven wrong. It really was delicious lemonade. I loved it because it was mellow, not face-squinchingly tart like some lemonades I have had. I can see why Rhode Islanders are proud of it. We walked around a bit more before we decided it was time to grab dinner at one of the nearby restaurants, The Capital Grill, while we waited for the festivities to begin. While we studied the menu, our server brought us a basket of homemade breads. We tried them all. They were really fresh and delicious. Everything on the menu sounded great. There was a lot of fresh seafood, steaks and tasty sounding sides. But it was hot outside and we just weren't that hungry, so we settled for corn soup and salads. The corn soup was really good with lots of fresh corn flavor. It was accented by a touch of crème fraîche and was especially good with the homemade bread. Dede chose a wedge salad with fresh tomatoes, blue cheese and applewood smoked bacon. You just can't beat a good wedge salad! My dinner was a spinach salad with chopped boiled egg, applewood smoked bacon, thinly sliced onion, and mushrooms. It was topped with a drizzle of warm bacon vinaigrette. It was very good, too. By the time we finished our salads, Waterfire was about ready to begin. We found ourselves a vantage point for watching the festivities along the edge of the water. We could see the wood stacked on top of iron platforms which were scattered up and down the length of the rivers. As daylight faded, boats floated past. The occupants carried torches which they used to light each of the bonfires. At the same time, music began to blare from speakers, helping to set the mood. When all the bonfires were blazing, more boats came by carrying performers. It was like interpretive dancing being performed in gondolas. People lined every edge of the water, snapping pictures and watching the show. As we walked back to our car, we noticed the State House was joining in the performance. Newport and Providence had completely exhausted us. We drove back to our little home away from home in Jamestown and fell into our beds! We had to get rested up for day three...Salem! Get ready! We were bewitched! Another big Yums Up to Rosemary and Thyme, Del's Lemonade, and the Capital Grille! Yep! 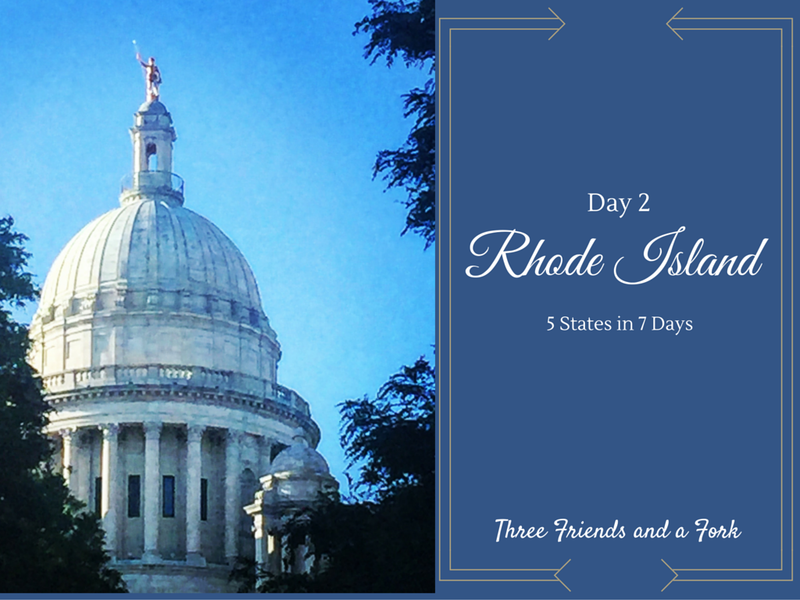 We are fans of Rhode Island!